I am taking an online sketching class with Sydney urban sketcher, Liz Steel. One of the exercises she had us do was to go to a place and look around us. Do thumbnail sketches of a few different views and then choose one to do a final sketch. 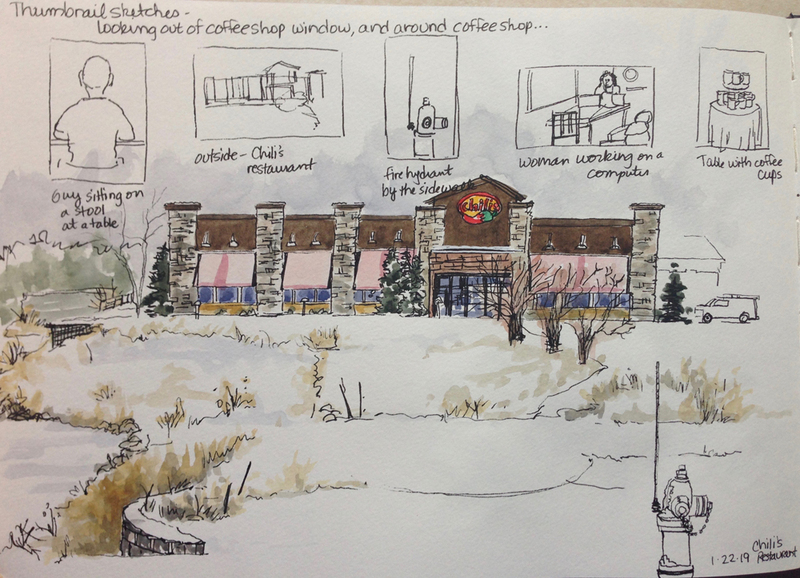 I went to a Caribou Coffee shop and sat by a large window. I looked around and did little sketches of a guy on a stool, a woman working on a computer, and a table with colorful coffee cups. Then I looked outside across the patio and parking lot. I noticed a red fire hydrant in the foreground, and a Chili’s restaurant a distance away. An iced-over pond was below it with retaining walls visible through the snow. I decided this would be my sketch! I started with my Faber Castill Pitt pen on the hydrant on the bottom of the blank page, then added the bare trees that led up to Chili’s, then drew the outlines of the restaurant itself. I got the main shapes in place, then began putting in the details—awnings (these are actually red, but with white snow, they look pink to the eye), brickwork, lamps, windows, etc…. I got those sketched in then worked the background, middle ground, and foreground. Once the ink work was done, I began to add watercolors, first to the building, then to the landscape around it. I like the thumbnails on the top of the page, they kind of tell my process and what I was thinking about…. This was so relaxing, sipping hot chocolate, listening to music, and sketching. Always a joy!